So I’m a weirdo. Let’s make that clear. I got this hairbrained idea to enter a Slow Cooker Chili competition! 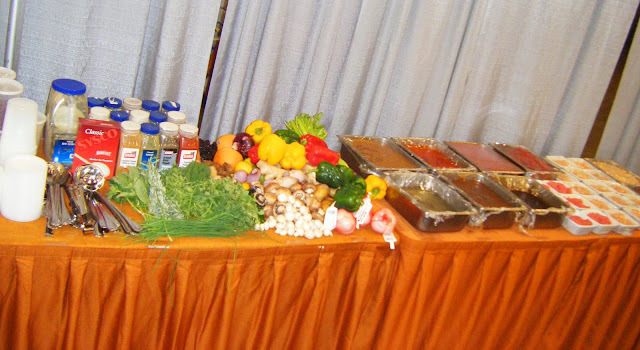 The Food Network, Southern Food & Wine Festival was going on at the Gaylord Opryland Hotel. I read on the Nashville Scene blog Bites there was to be a slow cooker competition, and they had waived the $50 entry fee, you got free parking (usually $18 or something), and got in free to the event. I thought, “What the hey, what have I got to lose?” The extra weirdo part is, I didn’t really tell anyone I was going to do this! I don’t like attention really, so I think that’s why I just kept it to myself. Literally, The Boy knew, and my one producer/friend of mine knew (because he was in the room when I read about the competition and thought about doing it). Oh, and I told my twitter friends! But other than that I didn’t tell my family or friends IRL (in real life). This was a really fun event, and a new experience for me. I did it totally alone. I lugged all my equipment around the behemoth that is the Gaylord Opryland Hotel till my arm turned blue, set up, and nervously fidgeted until it was time to begin. Luckily my basic “Sweet Heat Chicken Chili” was pretty darned easy to prepare. I brought most of my ingredients, but did use some provided. It took less than an hour to assemble the chili, and clean up. Then I was off to eat lots of free samples browse the exhibits. I got to see the Biscuit Lady, from the Loveless Cafe, do a demo, and I met a really talented food photographer. But mainly I just walked around and ate. I did purchase a few things from some of the vendors. I also went to the wine-tasting area. I am very ashamed to admit, out of the 26 vendors, I only sampled about 14 of them! I just couldn’t make it through it all! When it came time to plate up my finished dish, I realized I was a little inexperienced! Some people went all out. One team had an accompanying shot of tequila! Oh well, it was a learning experience. I totally went into this as just a fun thing to do, on a rainy Saturday I didn’t have anything else going on. I’m not a hugely competitive person, so it didn’t upset me to learn I didn’t advance to the next round. 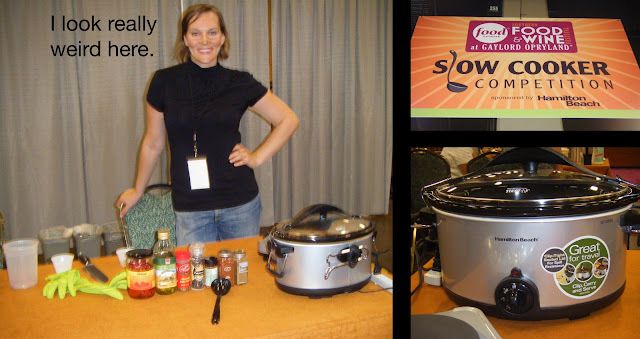 And, I got to keep the awesome slow cooker! It’s MUCH better & bigger than the one I currently have. Plus, if I had of advanced, I would of needed to shop for the ingredients that evening, and then get up early AGAIN on Sunday. And… being a night shift worker, getting up early just ain’t my thing! I would like to give a special shout out to all my “internet friends” who encouraged me to do this! It’s funny how I’ll share with strangers that I’m doing something like this. I twittered during the whole event pretty much, so even though I was there alone, I never felt that way with all the support tweets I was getting! If anything like this pops up in your town, whether it be a pie contest, a chili cook-off, a barbecue event, or whatever, consider doing it. I had a lot of fun, and I think stuff like this builds character. Believe me, as I’ve said MANY times before, if I can do it, ANYONE can do it! Heat oil in skillet over medium high heat. Dice onion and mince garlic. Saute onion and garlic until soft. Add ground chicken and cook until browned. Season with salt, pepper, and some of the chipotle powder. In slow cooker combine canned tomatoes, canned chilies, beans, beer, poblano pepper, habanerjo pepper, tomatillo, and the ground chicken and onion mixture. Add in chili powder, cumin, red pepper flakes, chipotle powder, and salt and pepper to taste. Cover and cook on low 8-10 hours, or on high 3-4 hours. Way to go for doing the competition, the chili looks yummy! Good for you! That is very impressive that you even entered! That's great that you just went for it. What a cool experience! Love the recipe. Negra Modelo is one of my favorite beers! Way to go! It was very exciting reading the tweets! Sweet score on the slow cooker too!! Good for you that you gave it a try! How fun! I like entering cooking competitions too! I love all the layers of flavor in your chili, it sounds great! I bet that was a lot of fun! I wish I would have known we were there Saturday walking around! So is this an original "EC" recipe?!? I assume this is probably what you were eating for lunch yesterday too! I love Chicken Chili better than regular! So glad you went ahead and did the competition! It looks like a lot of fun plus you got a free slow cooker! Great job! This sounds like so much fun! Maybe now that you've tried it once you can become a regular cooking competitor! I love Chicken chili as an interesting variation, so I"ll have to try this sometime.